Here is a small sample of the work we have completed for businesses and organizations in the public and private sectors. McMurray Environmental Solutions has worked with the Ottawa Citizen, conducting Waste Audits, for the past 20 years. During this time, the organization has managed to divert over 99% of its waste from local landfills. The Ottawa Citizen recently received a Recycling Council of Ontario Waste Minimization Award for best large business in Ontario. Telesat Canada, the main tenant of a Morguard Investment-owned property in Ottawa, Ontario, has implemented McMurray Environmental Solutions' Waste Reduction Workplan recommendations and diverted over 79% of its waste from landfill. Waste and Recycling Tender Preparation for several commercial clients has resulted in savings of up to 50% on BridgePort Realty’s commercial portfolio’s monthly waste management budget. These savings can be dedicated to the cost of improving waste diversion programs through the purchase of new bins, signage and other tools. McMurray Environmental Solutions designed and implemented a communications program for the Department of National Defence focused on waste reduction opportunities in the workplace. We also helped them form and train a Green Team and implement a Zero Waste program. As a result, National Defence Headquarters performs to industry best standards and enjoys a diversion rate of over 50% in one of the largest commercial office complexes in Ottawa. McMurray Environmental Solutions developed a Waste Audit Toolkit for the City of Ottawa. It is a collection of documents and tools that help Environmental Officers audit their facilities using a standardized methodology – from gathering data to reporting on the findings. The City of Ottawa uses the toolkit to measure the performance of its buildings against a diversion target of 60% by the year 2015. 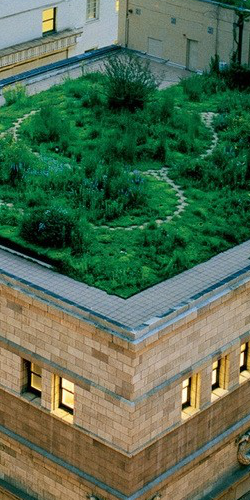 The goal of "going green" has been embraced by many libraries and library systems across North America. These organizations have taken on the challenge of committing to living and working in a more sustainable manner. McMurray Environmental Solutions is working with the Ottawa Public Library to assist them in greening their entire library portfolio. We are currently in the third phase of the project. The Zero Waste Dining Experience concept is a relatively new idea and provides the opportunity for patrons of a food court to minimize the impacts of their take out lunch experience. Minto believes that it has a corporate responsibility to the environment and that actively pursuing green initiatives is compatible with its growth and prosperity. In that spirit, McMurray Environmental Solutions partnered with Minto Properties Inc. to design and implement a composting program in the podium at Minto Place in Ottawa. This exciting new initiative includes the collection of both food preparation waste in the food service kitchens and in the patron dining areas. McMurray Environmental Solutions was chosen as a preferred supplier of Waste Audits and Waste Reduction Workplan consulting services to the health care sector in Ontario by the Ontario Hospital Association. In addition, Angie McMurray was chosen to participate on the selection committee for the Green Hospital Champion Implementation Fund. On June 28, 2012, the OHA announced the launch of the Green Hospital Champion Fund (GHCF) Implementation Program. Ontario Hospitals can apply for funding for green projects to cover up to $750,000 of eligible costs. The GHCF’s Implementation Program will select up to five green projects that provide an innovative approach to environmentally and fiscally beneficial improvements and will inspire further adoption of environmental programs in health care. The Green Hospital Champion Fund (GHCF) was established by the Ontario Hospital Association (OHA) with the support of the Ontario government through the Ontario Buys initiative, to help Ontario hospitals improve their environmental performance and reduce operating costs through implementation of green projects. McMurray Environmental Solutions has worked closely with the Minto Group to assist them in gaining industry wide recognition for their Ottawa based 180 Kent Street LEED Platinum office tower. Angie spearheaded the preparation of three award winning submissions: for both the local and National TOBY Building of the Year award from the Building Owners and Managers Association as well as the BOMA BESt Level 4 environmental certification. The Minto Group's 180 Kent Street office tower has been named Canada's Outstanding Building of the Year (TOBY®) by the Building Owners and Management Association of Canada (BOMA). This prestigious honour recognizes the utmost quality in commercial real estate buildings and rewards excellence in building management. The award also signifies Minto's invitation to participate in the BOMA International TOBY® Awards to be held in San Diego in 2013, where entrants will compete in 14 categories to win the highest honour as an international TOBY Award recipient. During this Canada-wide competition, all facets of the building's operations were thoroughly evaluated. This latest accolade follows the building's recent TOBY Award from BOMA's Ottawa chapter. As well, last November 180 Kent Street was the first building in Ottawa to receive the BOMA BESt Level 4 rating. This high level environmental certification was determined based on a 90 percent or higher score in the categories of air quality, water conservation, heat recovery, energy reduction, preventative maintenance, tenant relations, waste recovery, and environmental plans. This latest recognition helps to further McMurray Environmentals’ role as an industry wide leader in the design and structure of award winning business award submissions.